I finally got to see an actual iPad for the first time. Our IT person brought it up from downstairs and shared it with us. I played with a piano app and played Chariot’s of Fire for my coworkers. 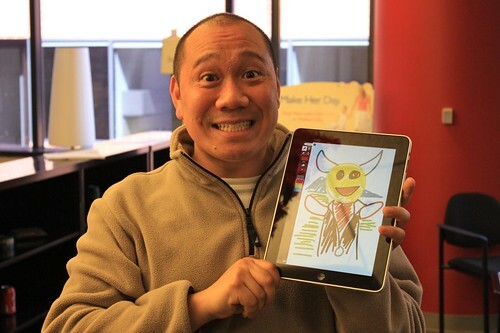 I then played around with the Adobe Ideas app and my coworker Ed took a photo of me with the Devil Doll I drew. I was also able to test if the Apple Component AV Cable works… and it does. This entry was posted in Techie and tagged ed, ipad. Bookmark the permalink.